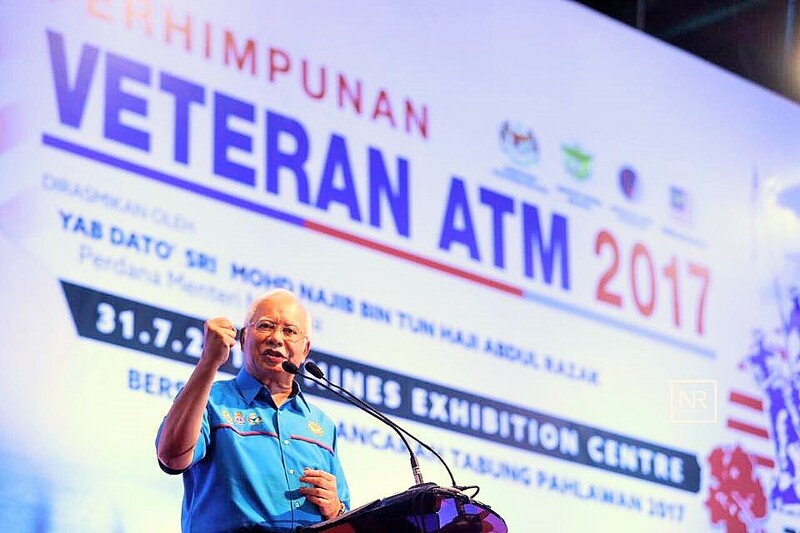 KUALA LUMPUR – Prime Minister, Datuk Seri Najib Tun Razak announced the National Service Aid (Bantuan Bakti Negara (BBN) for Malaysian Armed Forces (ATM) veterans. He said the new incentives will be given to the low income ATM veterans as a sign of appreciation for their services and sacrifices. The non-pensionable Malaysian Armed Forces (ATM) veterans will receive RM1,200 a year. “While for those who are pensioners, but do not receive BR1M, will receive RM600,” he said at the Malaysian Armed Forces Veteran Assembly while launching the Tabung Pahlawan 2017 Campaign here today. Najib also announced an increase in the ATM scheme of service named the Annuity Scheme (SAVE) and Disability Pension Scheme. “ATM’s veteran serving less than 10 years without receiving retirement and having to quit early due to injuries or disabilities are eligible for assistance of RM65. “This aid will be raised between 300 to 800 percent. Those with disabilities will receive RM500 to RM800. “Veterans with disabilities are eligible to receive a sum of RM500 a year through funds earned from the collection of the Tabung Pahlawan. This incentive will be increased to RM1,000. “Hajj quota for ATM’s veteran will also be increased to 400 this year compared to 100 people in the previous year, and the government will also channel RM5 million to the Tabung Pahlawan 2017,” he said. Meanwhile, Defense Minister, Datuk Seri Hishammuddin Tun Hussein said the incentives announced today are part of the agenda in the government’s incentive program. “What is announced by the Prime Minister is a proof to the public that the government is taking care of the welfare of the veterans. “In the next two months, the government will also announce a housing agenda,” he said while adding that the incentives given is not seasonal but a continuous effort. “The incentives are not given in advance for the coming election. In fact, the announcement today is important for us to look forward as a way to benefit those who have never been categorized. With this help, they can approach us,” he said. One of the ATM’s veteran, Kamaruddin Arshad, 60, said he was satisfied with the help given as he did not receive a pension. Kamaruddin served as a member of the ATM for 19 years and now works as a lorry driver in Rompin, Pahang. Qindao, China: KD Lekiu from the. KUALA LUMPUR APRIL 23- The government. Reporters Without Borders (RSF) said that. KUALA LUMPUR, April 17 — Lawyer. ABC Net today stated many reasons. KUALA LUMPUR 16 APRIL: The launching. Pakatan Harapan (PH) and KEADILAN respect. Johor: Bersatu leader, Osman Sapian has. The police today confirmed that there. KUCHING: The US government is planning. SERDANG: Johor is not a foreign. DATIN Seri Rosmah Mansor was slapped. KUALA LUMPUR: Nobody in Malaysia is. SEREMBAN: The Pakatan Harapan candidate for the. PETALING JAYA: Prime Minister Dr.
On April 3, Brunei passed a.
REMBAU: PKR president Datuk Seri Anwar. KUALA LUMPUR April 4: The opposition. KUALA LUMPUR April 3: Attoney General. KUALA LUMPUR April 2 –Deputy Minister. SHAH ALAM: Malaysians can emulate China’s. Tun Daim Zainuddin reiterated that the. KUALA LUMPUR: Prime Minister Tun. Langkawi – The excellent performance of. Langkawi MAR 26 – Malaysia plans. SHAH ALAM: Water consumption in Selangor. Sultan Ibrahim Sultan Iskandar yesterday reminded. KUALA LUMPUR 23 MAR: The Solidarity. KUALA LUMPUR: National Defence Minister of. KUALA LUMPUR: Member of Parliament for. KUALA LUMPUR: While the Prime. The 17-year-old dubbed ‘eggboy` plans to. KUALA LUMPUR: The decision on whether. KUALA LUMPUR: Malaysian citizens regardless of. KUALA LUMPUR: Malaysia has deported six. KUALA LUMPUR: A Malaysian was sentenced. KUALA LUMPUR MAR 4: The Pakatan. Immediately after its shocking defeat in. KUALA LUMPUR, March 1 —Sarawak Report. PUTTRAJAYA 28 FEB: Pakatan Harapan (PH). Kuala Lumpur 27 Feb: Datuk Seri. KLANG, Feb 25 ― Tun Dr.
KUALA LUMPUR, Feb 24 — The. KUALA LUMPUR FEB .22: The signing. PUTRAJAYA: The Transport Ministry vows to. Malaysia Former Prime Minister Ahmad Zahid. KUALA LUMPUR, Feb 19 — A.
KUALA LUMPUR Feb.19: The Ministry of. KUALA LUMPUR: The opposition party, the. Former prime minister Najib Abdul.